A Park car brings up the rear of #14 at Belmont, Nova Scotia on August 13, 2005. The Ocean (French: L'Océan), previously known as the Ocean Limited, is a passenger train operated by Via Rail in Canada between Montreal, Quebec and Halifax, Nova Scotia. It is the oldest continuously operated named passenger train in North America. The Ocean's schedule takes approximately 23 hours, running overnight in both directions. Together with The Canadian and Via's corridor trains, the Ocean provides a transcontinental service. 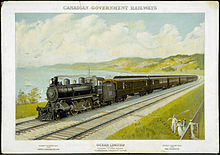 The Intercolonial Railway of Canada (IRC) inaugurated the Ocean Limited on July 3, 1904, as a summer-only "limited stop" service to supplement the Maritime Express. In Halifax, it connected with the Dominion Atlantic Railway's luxury train, the Flying Bluenose. During the immigration boom of the early 1900s, the Ocean Limited and other passenger trains on its route saw increased use as they provided key wintertime connections for both the Grand Trunk Railway and Canadian Pacific Railway in moving sponsored immigrants to lands in the Prairie provinces. In 1918, the IRC was merged into the Canadian National Railways (CNR) and the Ocean Limited continued its operation much as before. During both the First and Second World Wars, the Ocean Limited provided important service to the port of Halifax. CNR dropped the "Limited" from the train's name in 1966 as part of the company's adoption of bilingual names. :99:285 Despite the name change references to the Ocean Limited remain commonplace. During a landslide which affected the old IRC line near Rimouski, Quebec, in 1977, for six months CN diverted the Ocean onto another parallel line several hundred kilometres to the south, maintaining the same Halifax–Montreal schedule times. In 1976, CN placed operation of its passenger services under a new division using the marketing slogan "Via". In April 1978 this division was split off as a separate Crown corporation named Via Rail Canada, taking with it all CN passenger trains and equipment. The new national passenger rail service did not begin to change train names and operations until 1979, following the October 1978 assumption of all CPR passenger trains and equipment. The Ocean did not get renamed by Via, and in fact became supplanted on the Halifax–Moncton portion of its route in 1985 by another Via train, the Atlantic (formerly the Atlantic Limited), which saw its eastern terminus extended to Halifax from Saint John. This train also assumed the train numbers and equipment of the defunct CN passenger train Scotian, which survived only into the first few years of the Via era. (1979–1981) Daily operation (seven days a week) in both directions between Halifax-Montreal. Another Via train, the Atlantic also served these cities over a different route. (1981–1985) Daily operation (seven days a week) in both directions, albeit as the only through train between Halifax-Montreal, following cancellation of the Atlantic. (1985–1990) Daily operation (seven days a week) in both directions between Moncton and Montreal, following reinstatement of the Atlantic, which became the through train to Halifax. Passengers on the Ocean were forced to change trains at Moncton. (1990–1994) Operation three days a week in both directions between Halifax and Montreal following Via budget cuts. The Atlantic also operated three days a week and equipment rotated on the two trains. Service between Moncton and Halifax and between Saint-Hyacinthe and Montreal, the only common portions of the two routes, was six days a week. (1994–2012) Daily operation (six days a week) in both directions between Halifax and Montreal. The second cancellation of the Atlantic resulted in increased operation on the route of the Ocean. CN sold its portion of the Ocean's route between Rivière-du-Loup, QC, and Moncton, NB, to a shortline operator which operated the section from Rivière-du-Loup to Campbellton as the Chemin de fer Matapédia et du Golfe and the section from Campbellton to Moncton as the New Brunswick East Coast Railway. CN re-acquired these portions on November 3, 2008, and, as a result, the Ocean now again operates solely on CN trackage. October 26, 1998, saw CN abandon its scenic route along the waterfront of Lévis, Quebec, which served the combined railway station and ferry terminal. This section of the railway was redeveloped as an urban cycling trail, although the former Lévis train station and platform remain. Via Rail was forced to relocate the Ocean stop for the Quebec City region to Charny, necessitating a reverse move in each direction. Via offers a connecting shuttle van service for Ocean passengers between Charny and Quebec City (in 2014 Via moved the stop from Charny to Sainte-Foy - both the eastbound and westbound trains travel in to Sainte-Foy forward, and reverse back to the main line). (2006) The gradual phasing out of the restored stainless steel Budd cars was to have taken place, with all departures in both directions to have been operated in favor of the more modern European-built Renaissance equipment. However, Via has had occasional problems with this equipment and has had to use the Budd cars. Work on upgrading the Renaissance fleet has resulted in the need to operate one Budd consist (with the two other consists Renaissance outfitted) during the winter season. This took place through to the winter of 2011/2012, and ended after the service was reduced to three trips a week, with the exception of extra Budd-equipped trains during the Christmas holidays in 2014 and 2015. A stainless steel Park Car (originally built in 1954) is attached to the end of every train for passengers in Easterly Class (named "Sleeper Plus"). Though initially available only during the peak summer season and the Christmas holidays, the Park car is now part of every train year-round (as of 2013). The Renaissance cars' European couplers make it necessary to insert a transition car (numbered 7600-7602) between the Renaissance sleeping cars and the Park Car. The transition car is converted from a Renaissance sleeper shell and is effectively an empty walk-through corridor with carpeted floor and handrails along the walls. (2012) On June 27, 2012, Via Rail Canada announced plans to reduce frequency of the Ocean from six to three times per week. Starting October 2012, the Ocean departed Montreal on Wednesdays, Fridays and Sundays, and departed Halifax on Tuesdays, Fridays and Sundays. The Tuesday departure from Halifax was later changed to Wednesday, so the departure days are the same in both directions. (2014) In 2014, CN threatened to abandon the Newcastle Subdivision, an action which would have jeopardized the Ocean. As part of an agreement, the government of New Brunswick announced it would give $25 million to CN to upgrade and maintain freight service on the line's northern and southern sections. CN committed to spend an equal amount to maintain and operate these two pieces for freight services for the next 15 years. However, a 44-mile (71 km) section of track between Bathurst and Moncton was not part of the deal and the lack of rail traffic initially kept this part of the route from being saved. However, in May 2014, the federal government pledged $10.3 million to rebuild the line to save the Ocean. (2014) The Ocean celebrates its 110th year of service. The route taken by the Ocean runs through eastern Canada including the Island of Montreal and the city's skyline and suburbs, the lower St. Lawrence River valley, the Matapédia River valley, the south shore of Chaleur Bay and the forests of eastern New Brunswick, the Tantramar Marshes, the Cobequid Mountains and Wentworth Valley, the edge of Cobequid Bay and mixed farmland through central Nova Scotia to Halifax. Three Renaissance train-sets supported the Ocean route, but the reduction to 3 departures in each direction per week in late 2012 reduced the need to only 2 sets of equipment. These sets range from as few as 14 cars in the off season to as many as 21 cars during the peak summer period, and each includes a baggage car, several coach cars, a dining car bracketed by two service cars, multiple sleeping cars, a transition car (see discussion above) and a "Park" Sleeper Buffet-Lounge Dome Observation Car. The Ocean is almost invariably hauled by a pair of London, Ontario-built GM F40PH locomotives, all of which CAD Railway Industries of Montreal has upgraded to the F40PH-3 model. A third locomotive is sometimes added in the fall and winter to help deal with difficult track conditions. For several years prior to 2012, Via Rail removed one set of Renaissance equipment from service during the winter for upgrade work and replaced it with Budd-built stainless steel "HEP1" equipment (including a baggage car, coaches, a "Skyline" dome car, a dining car, "Chateau" sleepers, and a "Park" car). This practice ended after the service reduction, as only 2 sets of equipment were required. However, in 2014 and again in 2015, Via added trains during the Christmas holiday period, which they ran using a set of "HEP1" equipment much like in past years. These runs have been popular with railfans and the travelling public, as they provide more types of sleeping accommodations, a dome accessible to coach passengers, and a full dining car with meals cooked on board (a contrast to the catered meals in the normal Renaissance dining cars). Prior to August 2013, the Ocean ran from Montreal to Matapédia, Quebec, joined to Train 16/17, the "Montréal–Gaspé train" (formerly called the Chaleur) 3 times per week. In Matapédia, the trains were separated with Train 16 continuing to the Gaspé peninsula and Train 14 (the Ocean) continuing to Halifax (and vice versa with Trains 15/17). Train 16/17 had its own locomotive which ran from Montreal, resulting in the combined trains (14 + 16 and 15 + 17) running with three locomotives between Montreal and Matapédia. The Montréal–Gaspé train used Budd-built stainless steel passenger cars, including a "Skyline" dome car. It was not possible to pass between the two trains when connected. Trains 16/17 were suspended due to infrastructure problems on the line to Gaspé, and service will not resume until the line is upgraded. ^ Greenlaw, Christopher C. N. (2007). VIA Rail. Saint Paul, MN: MBI. ISBN 9780760325292. OCLC 71286639. ^ Underwood, Jay (May–June 2010). "History Follows the Ocean to the Ocean" (PDF). Canadian Rail. Canadian Railroad Historical Association (536): 95–106. ^ EuDaly, Kevin; et al. (2009). The Complete Book of North American Railroading. Minneapolis: Voyageur Press. ISBN 978-0-7603-2848-4. OCLC 209631579. ^ "Via Rail service cuts begin on schedule". Montreal Gazette. November 16, 1981. Retrieved 2013-02-26.